I've debated whether or not to do this post and decided to wait until the new year and not ruin everybody's holidays. The world was supposed to end on 12/21/2012. Well, for most of us it didn't, but that doesn't mean that for some it did. After successful surgery for an Aortic Aneurysm, my brother threw a blood clot that lodged in his brain. Another surgery for repair of the clot and he was on the mend until his brain hemorrhaged. His world ended Friday night 12/21/2012. I'm not looking for condolences, or "I'm sorry" or anything like that. I've made my peace with losing my brother. What I want to say is that I fought for several years to spend more time with him doing "brother" things and was only able to accomplish this a couple of times over the last 15 years or so. I managed to get him and his wife up here to Northern California once in those years. 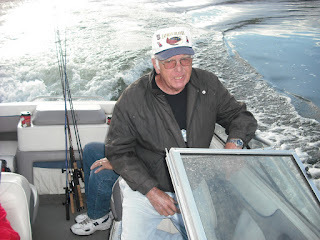 I only managed to get together with him once in 2010 to fish on Big Bear Lake. There were a couple of times passing through his place on the way to this cruise or that cruise, but that was it. My brother was about his family and it was like pulling teeth to get him to do something that wasn't related to his house, his family, or his cabin. I'm not saying this was a bad thing, all I'm saying is if you have family, spend as much time with them as you can because you never know when "they" will turn off their or your clock. I mentioned, in my book "Fishing, Ghosts, and My Mother's Gray Hair" how I wished I could have had more time with my Dad. Now there are two I wish I'd had more time with. Now is a good time to get out there and spend time with those you love, even if you have to beat them into submission to accomplish it. If you don't, there will come a time when you wish you had. No, this is not prompt for a New Year's Resolution. Just do it. I know you said your post wasn't about getting condolences but to prompt people to reach out to loved ones and that is a noble gesture and one people should embrace. My friend Mark, my deepest condolences to you and your family. My youngest brother is going in for surgery tomorrow for an aortic aneurism as well and I'm scared to death. What happens is out of our hands in those of the surgeon's and God. Peace my friend. Mark just getting to this now. I'm so sad for your loss. We received a phone call late Saturday evening that a good friend of ours father had passed unexpectedly from a Heart attack after having shoveled his drive. Typical Male pride prevented any medical interaction and he was found slumped in a chair later that evening. On the 4 hr drive back from my cabin I thought about how lucky my friend was to have at least spent some quality time with his father over the holidays and how much he would have regretted it if he didn't make the trip to see his dad. Life is very fragile and we often take it for granted. Your words of wisdom are than...Wise. Good advice and my sympathy for your loss. Truly sorry to hear about your brother---I can sympathize with you; I have lost three brothers and only have one brother left. We see each other at least once a month to still fish together. He lives about 3 hours away but we still find time to stay in touch. Life becomes so short once one gets into adulthood, cherish those times you have with your family and yourself. Thanks for reminding all of us how important it is too important in touch with family. Mark, Really sorry to hear about your brother.... Lost mine three years to the day before you and still find myself turning to give him a nod when I have a fish on on the river. Few things are irreplaceable in life, but family is one of them. Now you just have to take a little of him with you everytime you go out! All the other folks here have pretty well used up the thoughts or condolences that I would share with you, Mark. I lost my older brother a couple of years ago. Your advice, to spend time with your family as often as you can, cannot be more important. Take care.